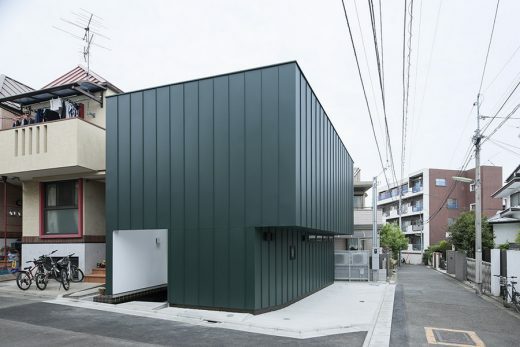 This two-story house stands in a densely populated area of Setagaya, Tokyo. This is the second building of a paired residential unit for the same clients, a married couple in their 60s. The Archetype designed their first residence in 2004. As the family members increased, they had to expand the property. Fortunately, the space right next to the house became vacant and the second residence was built there. Although the site is close to a main street, it is relatively calm and quiet. The Archetype set the agenda regarding how to solve the issues of house building in such a typically built-up area of Tokyo, and how to create new and nourishing relationships between the first and second houses, as well as the society and the landscape surrounding them. When building a house in a densely populated area, a question arises regarding whether or not to have windows facing the outside since it can give a sense of openness but it sacrifices certain degrees of privacy. We decided not to have large windows on its exterior. At first sight the flat, cubic building seems a little detached from the surroundings, yet once inside, it is remarkably open and airy since a part of the ceiling opens up to the sky. Each floor of the two-story building has no partitions. On the first floor, unlike the traditional Japanese house in which the floor is recessed and elevated at the entrance, the entryway continues to the living space without height difference, aimed for the future accessibility for the couple. On the second floor is the living/dining area, which is large enough for the three generations of the family to gather and enjoy their dinner. The spacious room with flat ceiling is equipped with a minimal kitchen system with downdraft ventilator that retracts itself when it’s not in use. The facility of the house is kept minimal since it is intended for the couple only, and the more fully functioning facility can be found at the main residence just across the alley- the two houses supports each other. A porch at the entrance area is what characterizes this second residence: the building’s baseboard rises and protrudes at the entrance area to create a bench. The space is protected by the partial ceiling and walls, yet since there is an opening on the ceiling there is always light and air coming in. It is neither inside nor outside; it works as a gathering area for the family as well as for others. The porch is the void in the cubic house that opens itself towards both inside and outside. It connects main residence and the second one as well as the two houses and society. Without breaking the harmony of the environment surrounding the house, the presence of the bench could be an icebreaker to the relationship between the family and the outside society in the built-up neighborhood, where the community tends to be insular. Sitting on the bench, the couple can relax and smoke a cigarette during the day, and later in the afternoon their grandchildren can come back from school and gather there before going back to the main residence. It functions almost like a park bench, but the space is more intimate than that, almost like a second living room that is semi-open to the public. Although at first sight, the building seems to be shut off from the outer world, the intimate porch space is open and welcoming, creating intimate relationship between the families, houses and the society.